Pressure Vessels | Rode Welding Inc. Among our diverse custom fabrication capabilities, Rode Welding is an authorized fabricator and repairer of pressure vessels for OEMs and heavy industrial applications. Whether a customer needs a brand-new system design and installation or a slight modification to an existing component, our experienced team will ensure that each pressure vessel is stamped and fabricated to meet ASME standards. 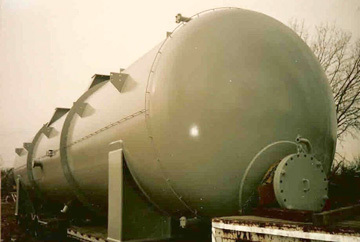 In compliance with these strict regulations, we craft our pressure vessels from a selection of materials including carbon steel, stainless steel, and other alloys under Section VIII, Division 1, “U” stamp of the ASME Code. Additionally, we are authorized to repair and alter pressure vessels under the National Board Boiler and Pressure Vessels Inspectors (“R” stamp) as well as supply rolled and welded cylinder shells with partial data reports. Division 1 – Pertains to design, material selection, fabrication methods, inspection, testing, and certification for pressure vessels exceeding 15 psig. Relevant ASME certifications include “U,” “UM,” and “UV” stamps. Division 2 – Contains more rigorous materials, design, and nondestructive testing requirements than Division 1. Also pertains to human occupancy pressure vessels, such as those utilized in the diving industry. Relevant ASME certifications include “U2” and “UV” stamps. Division 3 – Applicable to pressure vessels operating at internal or external pressures exceeding 10,000 psi. Relevant ASME certifications include “U3” and “UV3” stamps. At Rode Welding, we believe in using the most advanced technology to assist with our design and production processes. Our team begins by reviewing customer-supplied designs and requirements using Codeware’s Compress software to ensure that all code requirements are met. Our experienced welders, qualified under ASME Section IX, then custom fabricate each part using a variety of welding techniques. As in any industry, safety is of the utmost importance. Pressure vessels, especially, are often used in high-risk applications where substantial pressure differentials between the gasses or liquids in the tank and the ambient pressure can be dangerous or even deadly. Cracked vessels can leak or rupture, ultimately leading to explosions, fires, suffocations, or poisonings. In order to maximize workplace safety and prevent these potential OSHA risks posed by damaged pressure vessels, Rode prioritizes intensive quality control and testing. 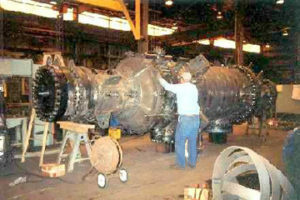 All of our fabrication procedures are held to the highest quality standards under ASME Sections VIII and IX. Our on-site staff inspectors are ASNT SNT-TC-1A Level II and AWS (American Welding Society) QC-1 CWI certified to perform rigorous nondestructive post-fab tests including liquid penetrant, magnetic particle, ultrasonic, radiography, and visual inspection. We take every precaution to ensure our customers experience safe pressure vessel installation and operation in accordance with relevant codes and safety standards. Rode has an expert team and over 65 years of experience to back our pressure vessel fabrication capabilities for OEMs and heavy industries. For more information about how we can help you get started on your next project, contact us today.